John Gruber of Daring Fireball on podcasting and Apple. And consider poor Odeo, a startup (co-founded by Blogger co-founder Evan Williams) based solely on podcasting. It’s downright amazing that Odeo — the first serious podcasting startup — was beaten to market by Apple. It’s not because Odeo moved slowly; it’s because Apple moved fast. I never understood the point of Odeo anyway. Recording audio over the net seems a particularly bad idea. The other bit of good fortune is the name: podcasting. Good fortune for Apple, at least. Clearly the “pod” in “podcasting” is about the iPod. Apple couldn’t have come up with a better name for this phenomenon if they’d gotten to choose it themselves. True. When I decided on naming my podcasting experiment Acecast, I thought long and hard about finding a name that did not have the “pod” as part of the site name. My thinking last winter was that the term “podcast” might later be replaced with something else, and if I then used “pod” as part of the name the site would look dated [it does anyway. Ed]. I was wrong about the durability of the “podcasting” term — but I am still happy with the Acecast name. There is some other goodness in there as well — on Apple’s strange RSS, support of podcasting in iTunes and the broken 3.1 iPod firmware (my advice is to stay with 3.0.2 if you want smart playlists to work). Acecast podcast number 4. 4 June 2005. Acecast podcast number four (MP3, 128Kbps, 14.7MB, 16m:05s) (you can download the MP3 file using the podcast icon/link if you are not using a podcasting application). Four is for sinister electronic music. This is a show I have wanted to do for some time. After Acecast’s new signature tune and a short intro comes a 15 minute long mix of five dark electronic tracks. All tracks from Northern Europe: England, Finland, Germany, Sweden and Norway. A mix of well-known (and previously played) acts like Delia Derbyshire and Biosphere, and some lesser known (unless you are heavily into industrial music) artists as Lomov, Haare and TeKstomp. The tracks are mixed and cut some more than on a normal Acecast production (the show could probably have been double length if I played the complete tracks), but I think it works quite well. The show is also the first Acecast to feature the Acecast signature tune, Wildspot by Belbury Poly (on the fine Ghostbox label). Even if you are no big fan of electronic music give it a try with headphones on. Enjoy (?). The next show will be my SXSW 2005 special, before I resume with a couple of “normal” podcasts. This will move to its own page soon as the notes are the same from show to show now. Kit: MXL V67 condenser microphone, Behringer UB802 mixer, Hercules DJ Console sound card. Applications: Audacity, iTunes, MP3Gain, MP3tag. If you like the show, but would prefer to have the 15 minute mix of music only, you can download the MP3 mix only of Acecast #4. The “no voiceover/no intro” variants will only be available for “mix-shows” like this. All tracks played are free and legal downloads. All tracks are copyright the artists and their record labels/music publishers. All tracks on this show are excerpts. Extended tracklisting for Acecast number 4, 4 June 2005. Wildspot — Belbury Poly. The new Acecast signature tune. Music of Spheres — Delia Derbyshire. The Temple (download.com) — Haare (download.com). Ilkka Vekka seems to be the real name of Haare. Brief playlist for the fourth podcast. Initial post: Sun, 5 Jun 2005. Playlist For The Fourth Acecast podcast. Produced 4 June 2005. Full details and MP3 download for the fourth Acecast podcast. Initial post: Sun, 05 Jun 2005. Rex Hammock on Apple and podcasting. Rex is doing some long and frequently updated articles on the impact of Apple’s announcement on podcasting support in iTunes over at rexblog. He writes about Microsoft now joining in (“playsafecatching” anyone? ), Sirius satellite radio and the iPod, advertising and micro-payments and more. One thing is for sure — when Apple release the next version of iTunes, podcasters are going to get a bigger audience. And there are hard times ahead for companies and individuals charging money for their turbo-charged RSS-readers (with enclosure support). Tod’s Podcasting 101: Illustrated Tips for Newbie Podcasters is a good resource for podcasters-to-be. Written back in October 2004 (the bronze age of podcasting), it is still valid today. Tod gives advice on recording, mixing and a few hints about microphones. Since Tod works for a broadcasting corporation he is also in a position to give some tips on interviews. Something funny happens to some people when they get in front of a microphone. They suddenly start speaking in what they believe to be “radio voice” — usually coming off sounding like over-the-top newscaster Ted Baxter from the Mary Tyler Moore show. The best voice you can use on the radio is your own. Speak the way you normally do. While you certainly want to speak clearly and perhaps gently emphasize some words, that doesn’t mean you should Punch! Every! Word! So don’t worry about your voice. Focus on being able to read cold (without practicing first which, paradoxically, comes from lots of practice) and on your ability to find and tell a good story. That’s what matters. Acecast podcast number 3. 4 May 2005. Acecast podcast number three (MP3, 128Kbps, 27.0MB, 29m:24s) (you can download the MP3 file using the podcast icon/link if you are not using a podcasting application). I play some blues-punk, a young Canadian MC/producer and some top-shelf electronica. There’s also space for everyone’s favourite Mormons, a bit of dance and Euro-decadence from Sweden, plus I include something which sounds like theme music from the ’70s. I finish the show with a fine acoustic track. I saw Gin Palace live some weeks ago (after hearing them first online thanks to their free MP3s). I liked it — so I made Gin Palace’s Kicking On my “fair podcasting CD” for April 2005. I’ve also bought their limited edition (75 copies) Live at the Marquee CD. Seems like the live album is sold out, but Kicking On should be easy to get hold of (try Amazon). If you like the sound of punk-blues then the strong brew from Gin Palace is recommended. As is a trip to the pub for “a little one”. The Biosphere track I play is quite short (and old), but Biosphere’s has a large MP3 section. Dawn at Vara is recommended, as is a purchase of Substrata and Patashnik . I’ve seen Biosphere, Scanner, Throbbing Gristle and Gin Palace live and I own records from several of the artists on this podcast. This is often how I end up finding free MP3s — think of an artist and check their website (so far very few of the tracks I play have been mentioned on large sites like 3hive). The Cadence Weapon track is via MPC - Post Grimeist. I like all tracks I play (or I wouldn’t play them), but I would like to mention the finishing track — Jeff Klein’s The Hustler . I am soon done with listening to the hundreds of South by Southwest’s free showcasing MP3s. There is a lot of acoustic acts out there. All nice and well-schooled. But for troubadour-type music to appeal to me there must be that little bit extra. And Jeff’s got it; clever production with a bit of texture, some extra noises in the soundscape, a distinct voice and some really nice steel-guitar going up and down with Jeff on The Hustler . I had around 80 tracks to select from for this show - and (by accident?) I have chosen two from Sweden’s fine Bevlar label. It’s been a few months since I did the downloads (Rasmus and Lindeberg, the labels two first releases) and there are now further tracks for download (including a sampler album). All releases from Bevlar are free and if you want to burn a CD, there are nice covers to print (in PDF-format). 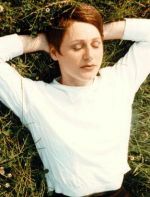 The poet Penny Broadhurst (heard on the previous podcast) kindly introduces this show. I used an MXL V67 condenser microphone plugged through a Behringer UB802 mixer to do the voice track. Applications used were the same as previously (MP3Gain is a gem). The last two voiceovers was done at a different time than the others and sound slightly different (and metal-boxy, apologies) for some unknown reason. I do not treat the voice after the mixer; I know I could use a compressor or Audacity to compress to get more of a big “radio voice” — but it adds time and complexity. Extended tracklisting for Acecast number 3, 4 May 2005. If you like the music in my little show (or prefer not to listen to it at all) use the links for each MP3. All MP3-links point to the artist’s own website or record label, unless listed otherwise. 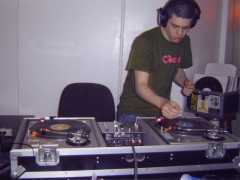 All tracks were available at the time when the podcast was recorded (early May 2005). Kicking On — Gin Palace. Heart of Glass — Daniel Lindeberg with Greta Rootstein. Sharks — Cadence Weapon (Cadence is also blogging with attitude). Hollywood (Radio Edit) — Rasmus. Som Evige Stjerner — Biosphere. Branded and Soldered — Scanner/Throbbing Gristle. The Hustler (sxsw 2005) — Jeff Klein. Brief playlist for the third podcast. Initial post: Thu, 5 May 2005. Playlist For The Third Acecast podcast. Produced 4 May 2005. Inspector 071 — Jackson 170. The Hustler — Jeff Klein. Full details and MP3 download for the third Acecast podcast. Initial post: Wed, 04 May 2005.